Rep. Doug Cox – Planned Parenthood? And he’s a Republican? 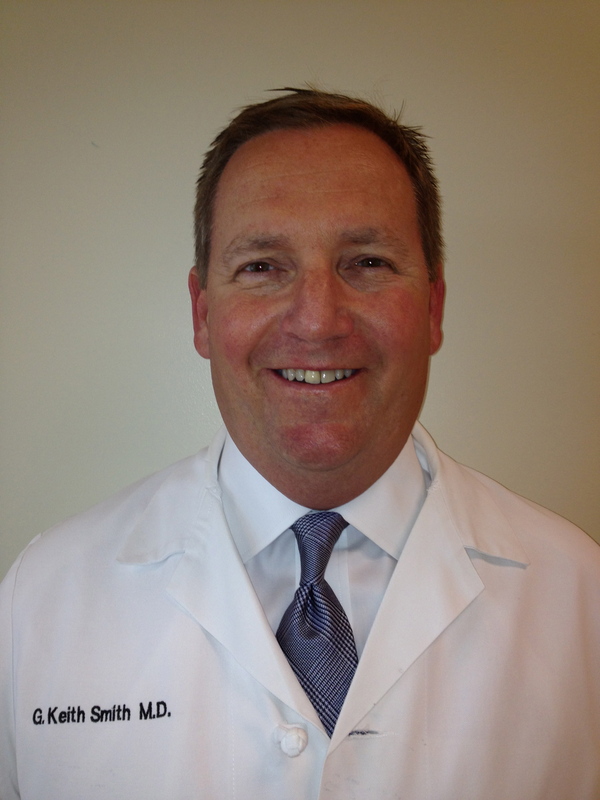 OK-SAFE, Inc. – Dr. Doug Cox is a Republican first elected in 2005 to represent HD 5. This House district is in Delaware and Mayes counties in the northeast part of the state of Oklahoma. Most folks think of Republicans are being pro-life, limited government types. Apparently, Dr. Doug Cox is neither. Rep. Doug Cox is the House author of SB 640; Senator Brian Crain is the author in the Senate. The proposed language for this bill expands Medicaid coverage in the state of Oklahoma, using Insure Oklahoma’s existing framework, and puts the already over-funded Oklahoma Health Care Authority (OHCA) in charge of this system. The proposal provides the means to connect the payer (in this case the state) to the patient and the providers. Linking together the patient, provider and the payer into one connected system (data collectors all) is the heart of universal health care’s “health care reform”. It is the stuff of Obamacare. So much for “pro-life, limited government” Republicans. Apparently, for Rep. Cox and Sen. Crain, that’s only the stuff of re-election campaigns. 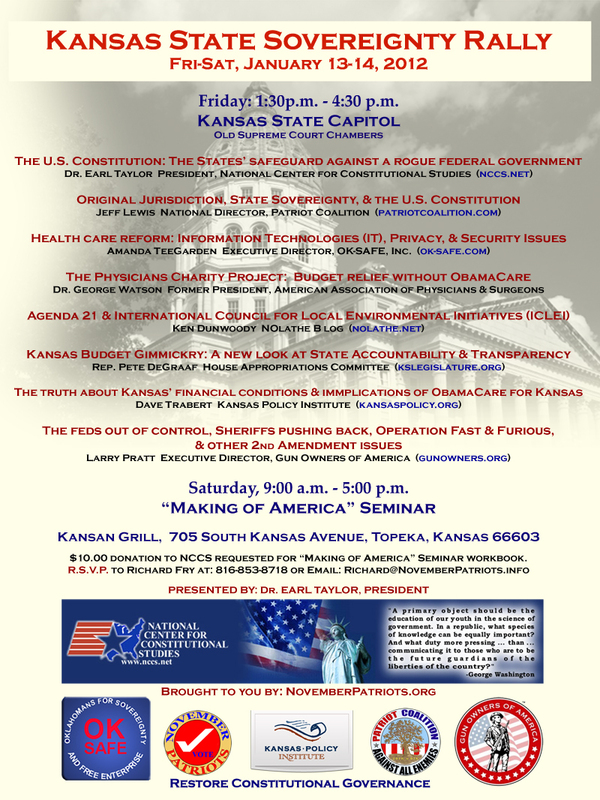 If you live in or near Kansas, be sure to mark your calendars to attend the upcoming Kansas State Sovereignty Rally and “Making of America” seminar, to be held on Friday and Saturday, January 13-14, 2012 in Topeka, KS. This event is sponsored by November Patriots. Friday – The Kansas State Sovereignty Rally will be held from 1:30 pm to 4:30 pm on Friday, January 13th, at the Kansas state capitol in the old Supreme Court chambers. Address for the Capitol is 10th and Jackson, Topeka, KS, 66612. Saturday – The “Making of America” Seminar will run from 9:00 am to 5:00 pm on Saturday, January 14th, at the Kansan Grill, 705 South Kansas Ave., Topeka, KS, 66603. Presentation will be by Dr. Earl Taylor, President of NCCS. This is the fourth annual rally sponsored by November Patriots, set to coincide with the beginning of the Kansas Legislative Session. Larry Pratt, Executive Director, Gun Owners of America – The Feds Out of Control, Sheriff’s Pushing Back, Operation Fast & Furious, and other 2nd Amendment Issues. This day-long event runs from 9:00 am to 5:00 pm at the Kansas Grill, 705 S. Kansas Ave., in Topeka, KS. “Making of America” will be presented by NCCS President, Dr. Earl Taylor. Donations of $10.00 to NCCS (National Center for Constitutional Studies) for the seminar workbook are requested. 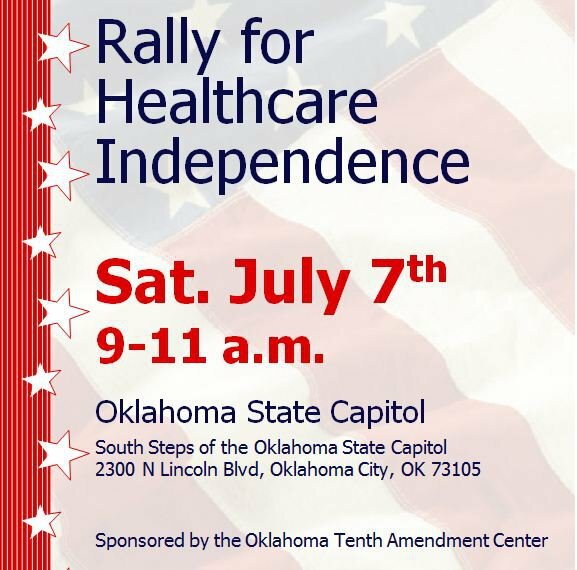 See Rally flyer below for all these details and more. On Tuesday, November 22, 2011 a neurosurgeon named “Jeff” called in to the Mark Levin radio show , and said he had just returned from a seminar in Washington, D.C. where a group of surgeons were reading over what the Obama administration’s plans would be for those over 70 who needed advanced neurosurgery. Basically, the health care plan for “advanced neurosurgical care” for those over 70 years of age is “not generally indicated”. If someone over 70 goes to an emergency room, and is on a government-supported plan, that person will get what is called “comfort care” instead of the more advanced life-saving care. These people are not referred to as patients, but as “units”. Mis-named “ethics panels” will make the decisions about whether a patient over 70 should receive advanced surgical care. In general, they will not. To hear this call, follow this link to the 11/22/11 show. Audio of the caller begins at minute marker 44:34. To Oklahoma’s Republican leadership – are you listening? Can you say death panels?